In honor of last night’s full moon, the fullest moon is 20 years btw, I created my second jamie ridler-inspired dreamboard. jamie asks us to ask ourselves what is brewing within and what needs sharing with the world…what do i wish for….? I wish to do ‘something’ with my photographs. Now that i look at the board again, i realize that all the images are my photos, wishes really do come true around us. I have a specific photography / multi-media project i would like to work on. That wish is represented by the little booklet in the upper left corner. The flower has the number 16 in its center; that’s how many houses i’ve lived in throughout my life. There is a photo essay here wanting to be born. My kids don’t know ‘my story’–the places I’ve lived, the challenges my mother faced and overcame, the magic in my young adult life and I want to show it to them in photographs. 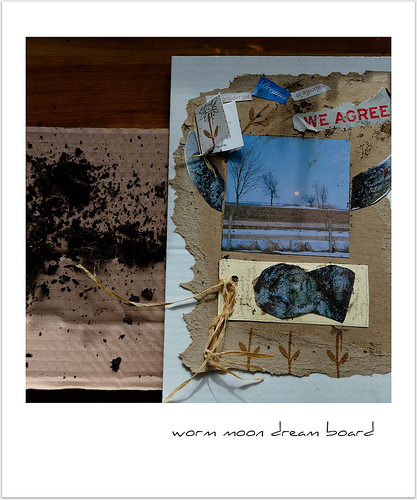 That’s what i wanted this board to be about but I got side-tracked with angels and wings and beauty and garden dirt. The We Agree: i’m not searching for approval, more like accountibility. I want people to inquire about the 16 Petal project. hey, now it even has a name. thanks, friends! “Life is not what one lived, but what one remembers and how one remembers it in order to recount it. –Gabriel Garcia Marquez. Maybe you didn't get sidetracked…maybe its saying the angels are watching over your project, wings…it taking flight, and the dirt…grounded. Just a thought…:-)It is a lovely dream board! And, I love the name – 16 Petals.